This effective Tea Tree Lemon Sage trio work together to refresh, replenish and thicken your hair. Refreshing and uplifting, the innovative ingredients deeply cleanse the hair while providing intense nourishment and shine. Hair will be effectively detangled, strengthened and hydrated. Finish off your style with a salon perfect finish with the Lemon Sage Thickening Spray, working to boost shine and hold. 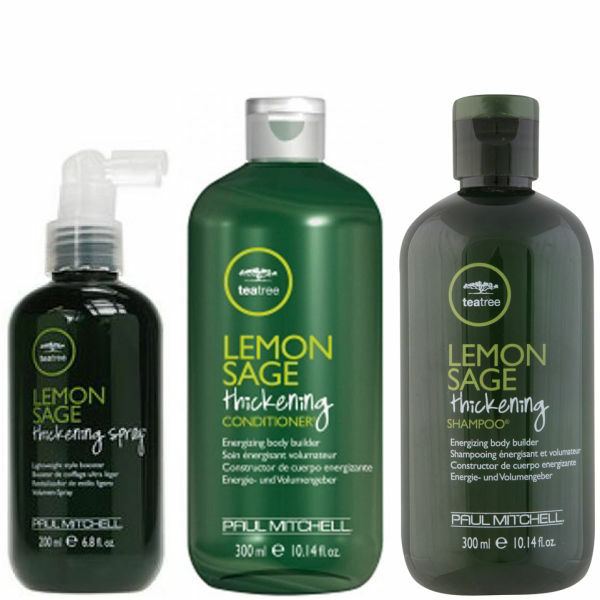 Bursting with natural extracts of uplifting lemon, soothing sage, tingly peppermint and tea tree oil, Paul Mitchell Tea Tree Lemon Sage Thickening Shampoo (which is safe on colour treated hair) invigorates and renews your mind and spirit as it cleanses your hair. Effectively detangle and add body to your normal to fine hair with Paul Mitchell Tea Tree Lemon Sage Thickening Conditioner. It thickens your hair, giving it more strength and added moisture. A cocktail of lightweight thickening elements pump up the volume and boost shine while flexible styling agents grip skinny strands with a light, clean hold. Suitable for all hair types.